Today is July 31st, your Feast Day, and here I am writing a letter to you, one of God’s illustrious saints. It seems almost presumptuous to be doing so, for someone from the 21st century—like me—going back in time to correspond with you. But it doesn’t seem like such a bad idea; after all, in your time, you, too, were a letter writer, and a prodigious one at that—you supposedly wrote over 7,000 letters! However, it was from your writings, prayers, letters and witness that a religious congregation, the Society of Jesus—more familiarly known to us today as the Jesuits—came to be. You needn’t worry—I am not writing with the purpose of creating or founding anything of importance, like you did. Besides, coming up with ideas like that requires great faith and vision that only a saint like you could only possess and believe me, I’m far from anything like that when it comes to faith, vision or witness. But just the same, I can picture you sitting at your desk, amidst your papers and pens and various correspondence, about to put the candle alight. So I plead for your indulgence while I put this letter on your desk in front of you, preoccupied as you are with your Society. You must have been asked many questions in your lifetime; I can only imagine all the questions many of the faithful through the ages have asked you since you entered the heavenly society of eternity. I suppose the obvious one would be whether you knew how great your congregation would become and how influential throughout history it would be. Only you know the answer to that of course; possibly in your many visions you were permitted to have just a gleam of it? The only thing you—and we—know for sure is that it was an audacious undertaking on your part. As a young man, you were a daring sort, ready to go into battle to win glory and yet, you were a dreamy reader (that is, when you read books) of romance, chivalry and derring-do. You were like many of the saints in this way—the example of Francis of Assisi comes to mind—who were willing to put everything aside for an adventure of another sort. Despite obstacles and setbacks, you plunged ahead like the soldier you once were, and never looked back. That is probably the most noticeable aspect of your personality and in a way, it is appropriate that your Society is similarly constituted. Through the ages, Jesuits have entered every field imaginable in order to bring God to man and man to God with the same determination and effort you extended in your labors. And as you know, they still do that today, and in ways that even a saint in your day could ever have imagined. 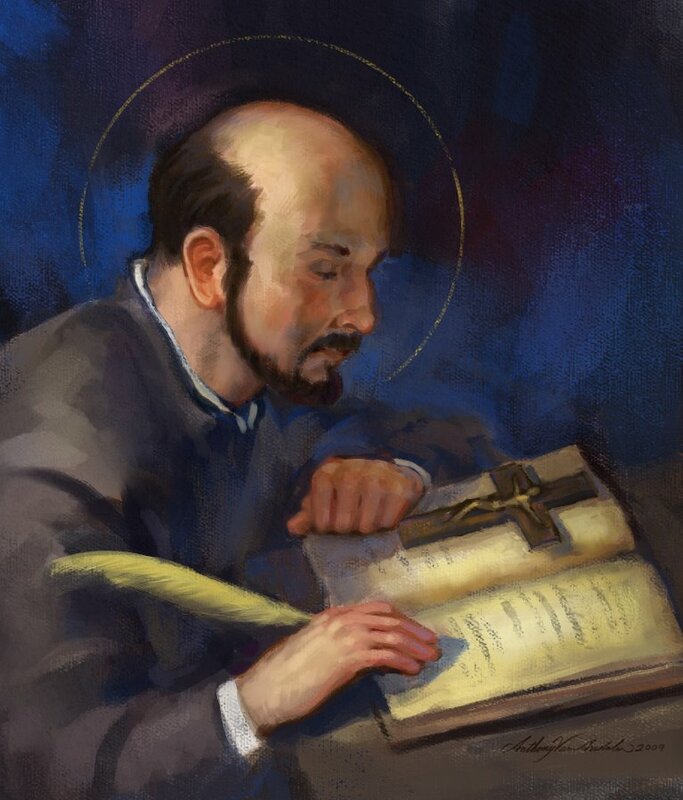 On this day, which is the anniversary of your death (which occurred at age 65 in 1556 from a case of malaria), everyone throughout the world who is a Jesuit or is associated with the Jesuits in any way wishes one another a Happy Feast Day, in remembrance of you and your eventful life. For those who are not Catholic, it must seem strange to “celebrate” the day of a person’s death. It is not that which is celebrated. What it is we celebrate or commemorate, is the totality of a person’s life and the impact it has had—and continues to have on people through the ages down to the present time. In your case, like Saint Patrick, the Church selected the day of your death to remember the example of your life. That is not true in the case of every saint of course, but it is true with respect to the both of you. Since your time, scores of books and articles have been written about you and numerous conferences and talks have been presented concerning your influence upon the Church and the wider world. Like many an interesting historical figure, your person and your message continue to be an inexhaustible source of discovery, particularly for those trying to find meaning, reflection and understanding in their journey toward God. In studying and trying to understand you, I came across certain characteristics that you embody to a great degree: you were a determined seeker, you sought knowledge, you reached out to others, you persevered despite health issues and other obstacles in your path—in effect, you literally soldiered on. As a youth, you seemed to be indifferent toward your studies; if you read at all, it was the novels that were fashionable of the time, those of soldierly daring and chivalry. It was probably those stories that put the idea into your head about being a soldier and made you become one. And then, when you were seriously wounded after fighting in battle at Pamplona and trying mightily to recover from those grievous leg wounds (without the benefit of anesthesia or pain reducer of any sort, whatever passed for pain relievers in your day) you began to read religious literature that was available (from your sister-in-law) and then you saw the world in a different light, God’s light. It was such devotional reading that prompted you to begin your life-long journey to seek out God, which ultimately resulted in your founding of the Jesuits. And along the way, you sought education in ways you never sought before, all in the hopes of obtaining sacred orders. And, as a result of that, it in turn provided the impetus for an everlasting Jesuit legacy, the great network of schools and universities throughout the world that the Society is renowned for today. The creation of this educational network emphasized the importance of education for everyone living in the world so that the knowledge gained would help spur us toward the better world that the Gospel points us to. Quite possibly, another notable aspect of your personality is that you were a sociable type of person. Well, you had to be, being the youngest of thirteen children! So, right from the start you were in the middle of a crowd, even if it was in the family. But as a saint, you would have to be a “people person,” right? Well, yes, but there have been saintly hermits and others in Church history who embraced prayerful solitude in caves and huts and hermitages; but in your case, you were constantly in the center of things; you were, as we would say today, “in the public square” ready to meet people where they are, ready to engage people in a discussion about life and God. In your former “existence,” you had a reputation for enjoying the “good life” and everything that entailed. Even when you changed—for the better—you didn’t entirely leave behind the traces of your aristocratic bearing; people noticed a certain aura about you and you used that to effect. There is the story that once after your conversion you went back to your hometown years later and preached against the “evils” of card playing and gambling; it is said that the people were so affected by your admonitions that the entire town dumped their supply of playing cards in the river and refrained from playing them for two whole years. You were definitely not the patron saint of the card sharks! When you began to evangelizing work, you adopted rather extreme penitential practices (as us “moderns” would tend to think of it) of discarding the clothing of your formerly wealthy lifestyle and donning the proverbial sackcloth for your daily attire and letting (at least at first) your hair and nails grow, giving you a real pauper-like appearance. Indeed, you were nicknamed the “Sackman” when people first saw you. You sought out everybody for evangelization: children and adults, even the pope whose permission you sought to establish your Society. You started your Society with the friends you made while studying in Paris, most notably Peter Faber and Francis Xavier. And this “reaching out” as it were, is quite visibly illustrated in the titular Jesuit church in Rome, the Gesu—it is right there, in the middle of the street, in the thick of things, a city of God centered in the city of man. For all that you did throughout your life, what I found most striking was the fact that you weren’t exactly the most robust of saints—at least in the physical sense. As a result of your exacting labors, you suffered from periods of poor health, most notably from stomach ailments. Along with the leg injuries you endured from your military service—which left you with a noticeable limp (and after having to endure your leg being broken and reset in order to “heal” it)—your health must have been quite a cross for you to bear; yet bear it you did, and all for the greater glory of God. I recently saw a photograph of your room in Rome, with its simple furnishings and your shoes which really look like slippers, so small and fragile looking. You might not have been a big man physically, but you certainly were—and are—a giant spiritually. And your influence continues today through scores of Jesuits all over the world, as well as in the people they minister to—all because of you and the Master you sought to serve. There are not many people who can bequeath a legacy like that, religious or secular. Well, as one of my Irish aunts would say when ending one of her letters, dear Saint Ignatius, it is time for my pen to “dry up.” If you pardon me for saying so, writing this letter has been quite the “spiritual exercise.” I thank you for taking the time to read these random thoughts on your Feast Day and I hope you don’t mind too much. And I especially thank you for reading this letter from someone who didn’t go to Fordham—I’m a Manhattan College/Christian Brothers grad, you see—but I think you’ll agree that it is quite possible for the Ram and the Jasper to coexist peacefully, (like the lion and the lamb) sportingly and otherwise. Believe me, I tried to get into Fordham, only my grades in in a certain subject were lousy. Fortunately, though, I work at America now, and that ought to make up for it! So, on your Feast Day—and every day—Saint Ignatius, pray for us.